For the first time since the 2000 Olympic Games, basketball news stories are on the front page of non-sport media publication in France. 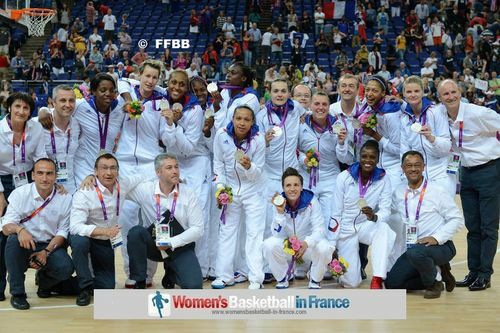 The beauty of the Olympic Games and live television coverage by France TV was for more people to watch and discover women's basketball at its best. 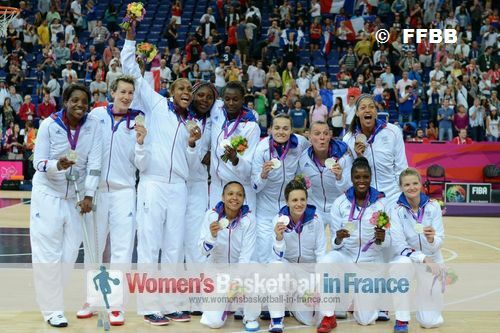 The USA have dominated the women's event since 1996 and continue their reign as champions with a comfortable victory against France (86-50). Australia completed the podium by defeating Russia in the bronze medal match (83-74). The final match from the London Olympic Basket women's tournament between France and the USA was only close for the first ten minutes. Sandrine Gruda scored the first points of the match to the delight of the French supporters. But the USA did not waste much time in scoring and marking their authority in the game. Yet during the early cat and mouse game France were able to go in front briefly with a trey by Edwige Lawson-Wade on the six-minute mark (13-11). However with Sue Bird running the show and Candace Parker and Tina Charles finishing, the USA edged the first quarter (20-15). France struggled with looking after the ball in the second quarter and missed too many easy shoots. Meanwhile Parker continued her demolition act (15 points in the first half) as the USA went on a 9-2 run to go into the break leading (37-25). Bird brought the contest to an end with a three-ball (50-32) with 5:50 to play in the third quarter. Pierre Vincent called a time-out. But nothing changed as the USA completed a 21-1 run to put the game out of reach for France (62-32) with just under 28 minutes played. The game was played out in good spirit with all the USA players getting on the score sheet. Parker finished top scorer with 21 points and 11 rebounds while Bird had 11 points and 3 assists. For France, Gruda and Lawson-Wade both scored 12 points while Céline Dumerc and Isabelle Yacoubou-Dehoui both had 8 points. The Australian veterans, Lauren Jackson, Kristi Harrower and Suzy Batkovic led their side with 25, 21 and 17 points respectively in their (84-74) victory against Russia. Jackson scored 21 of her points during the second second half of the game. The Australians had won the Silver medal at the last three games. This time they had to settle for Bonze. For Russia Becky Hammon led the scoring with 19 points. For the USA this is their 7th Olympic Gold medal and their 41st consecutive victory. The USA did not participate in the 1980 games. Otherwise since the first Olympic tournament in 1976 they have always won a medal, Silver in 1976 and Bronze in 1992 otherwise Gold.